This photo shows the testing of landing craft in preparation for D-Day somewhere in Brighton. I’m afraid I already know the location, but I’ll let you guess first before I reveal the answer (well if I need to), the place is such a surprise! I know that a Canadian Tank Regiment was stationed there during WW2, so could it be Stanmer Park? I think this is Preston Park and from the edging surrounds it may be where the bowling greens were; now many [all?] are wild flower beds. I believe this is Preston Park. If I am wrong, my second guess is Stanmer Park. As we have been invited to guess, I would go for Preston Park, which has trees and grass not dissimilar to the photo. My first guess might have been Hove Park, but you did say Brighton, Peter. The long wall in the photo reminds me of a railway platform, but this was possibly a temporary structure just for the testing. Is that a small building in the centre background? The Level and Queen’s Park would be my other guesses, but I’m hedging my bets now. I will look forward to reading the answer! Could even be the ‘old’ Falmer pond! If the photo was taken at Stanmer Park, as suggested by Bob, the small building in the centre background could be one of the two, now white painted, lodge buildings at the main Lewes Road entrance to the park. That indicates the testing area was just a few yards past the entrance and to the left. I wish my old Dad was still here – he would have known the location. I think Stanmer Park is a good suggestion. Being on the outskirts of Brighton it would provide more seclusion than the public and relatively confined open spaces in the town. But I haven’t a clue to be honest. 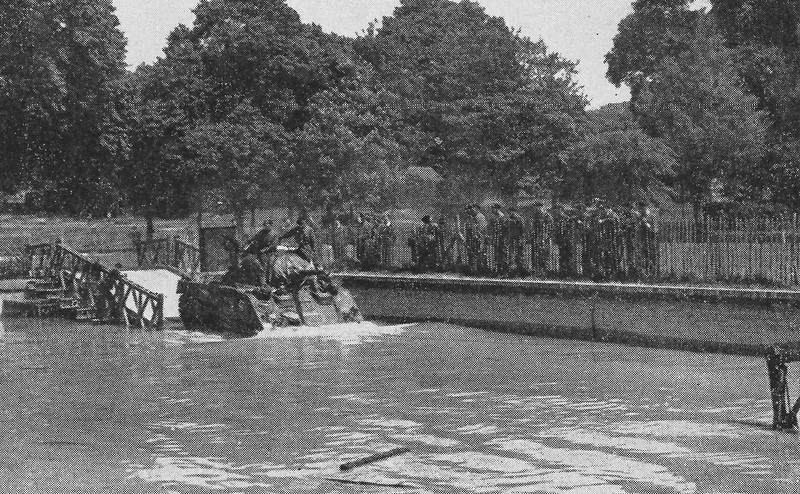 My copy of ‘ Brighton and Hove in Battledress ‘ published in 1946 has the same photograph on page 90 captioned “Tanks ‘waterproofed’ for D-Day being tested in the big static water basin in Preston Park”. Preston Park is correct, well done all, especially Geoff who defined the exact location almost perfectly. The tank and location can still be seen in the 1946 Sussex Air Photo Catalogue, on line here: http://m.sussex.ac.uk/geography/researchprojects/airphotos-historic/1940/index.html&#160; use the zoom button on the right and use the v keys to get Brighton in view, and then click on the aircraft and use the zoom, the static tank can be seen at the end of the tennis courts. I think then if you look on google maps, the outline of the disturbed earth can be seen.